The photographers' entrance to the stadium is the loading dock tunnel. The same place where team buses will drop off players on game day. If you've ever covered a Summer or Winter Olympic Games, then you'll have some ideas of the security measures the NFL will have in place for Super Bowl XXXVII Jan. 27, 2003 at Qualcomm Stadium in San Diego. At the recent photographers' walk-through at "The Q", the NFL's Pete Abitante and consulting architect Jerry Anderson led members of the national media and local dailies through a tour of the venue, pointing out photo positions and work areas. Abitante said that the set up for the media will be very similar to what was done for the last Super Bowl held in San Diego, 4 years ago with some minor changes. With increased security measures in this Post-9/11 Era, a 200-foot security perimeter will be established around Qualcomm Stadium for the Super Bowl. This is not unlike the security measures around Olympic venues. The media trailer compound location, entry points and post-game interview areas are the same. There are some changes however. * There will be, as started at last year's Super Bowl in New Orleans, a 200-foot security zone surrounding the stadium. This in not unlike what is done for Olympic venues. What this means is that to enter the security zone, you have to have a picture ID and credential. Also you will have to pass through a mag and all bags and cases will be searched. * As far as parking, there is NO parking within the 200-foot security perimeter. But there is parking (for which we have two passes) in the parking lots outside of the zone. I estimate that it'll be about a 400 to 500 yard walk to the media entrance from the parking lot … depending on where we get a space. * Those without parking are to take either public transit (the city trolley line has a station on the south side of the stadium) or shuttle buses from official NFL hotels. The trolley station is the exact opposite of where the media compound is, so it will take quiet a while to walk there after arriving at the stadium. The shuttle buses will drop within 50 yards of the media entrance. The media entrance in located at parking lot area D1 on the Qualcomm map. * A "soft lock down" in the secure zone starts Jan.18 (Saturday) and the "hard lock down" will be instituted midnight Jan.24 (Friday). Tight security measures will start with the hard lock down and the security sweep of the stadium and media compound will start at midnight the 24th. * After going through the usual security screening (mag & bags) to get into the secure area, if you have a two-way radio, those have to be checked at the RF table. All radios have to be approved and have stickers signifying approval before they will be allowed to use in the stadium. * After clearing security and the RF check, photographers proceed to the Photographers Check-In. This is OUTSIDE the stadium. 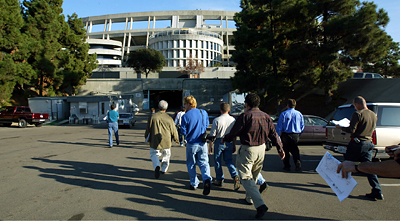 In previous years (including the last time the game was at Qualcomm) the Photographers Check-In was located inside the stadium. * There is no photo work area inside the stadium. The photo area will be a trailer compound just off of the loading dock tunnel to the stadium in parking lot area G1on the Qualcomm map. The assigned overhead photo spots are the west endzone --- in the first row of seats in Sections 19 and 23 on the louge level and on press box (south) side in section 38 in the club level. These are VERY high in my opinion. The west endzone spot is in the 2nd deck and the press box side up spot is even higher. West endzone overhead photo spot is the first row in the 2nd deck behind the Budweiser sign. The west endzone spot is workable, but the photographer will be limited to shooting from about the 25 - yard line to the goal line. And that would be with a 600mm lens. The center press box side up position in the third deck of the stadium for action it would be a 600mm AND a 1.4x or 2x converter. And that would still be pretty loose. If you are looking for an "aerial" type of photo, then this would be this place to shoot it. It is also NOT at the 50-yard line, more like the 30. * Credential pick up for will start on Monday Jan. 23 at the Super Bowl Media Center, which is the San Diego Convention Center on the marina. * The media photo day for both teams is 9 AM Tuesday Jan. 24 at Qualcomm Stadium. SI's DOP Steve Fine and staff photographer John McDonough walk off the Qualcomm Stadium field at the end of the Super Bowl media walk through. * The lighting test will be Jan. 24 Tuesday night at a time TBA. The hotels are assigned by the league.